This concept drawing was submitted to the city's Redevelopment Authority for the waterfront project. 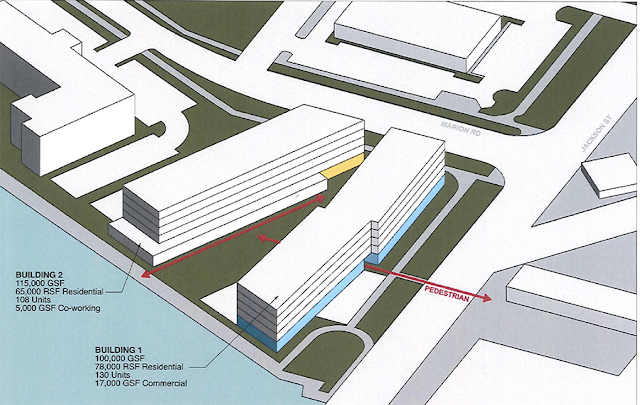 A development group that includes two Iowa companies and a Madison investor is proposing to build a two-building, $32 million complex overlooking the Fox River at the corner of Jackson Street and Marion Road. The city’s Redevelopment Authority agreed Nov. 12 to accept an option to purchase the parcel from an Iowa company called Grand Management LLC. According to City Manager Mark Rohloff, the developer has three partners: ECHO Development Group, Lancaster Investments and Slingshot Architecture. He warned that parking could be an issue, and the project still needs to go through multiple development reviews. Slingshot is based in Des Moines, and Echo is in Cedar Falls. Lancaster is headed by Jon Lancaster, a former car dealer in Madison. Local developer Andy Dumke had also prepared a proposal for the site but decided to withdraw it.